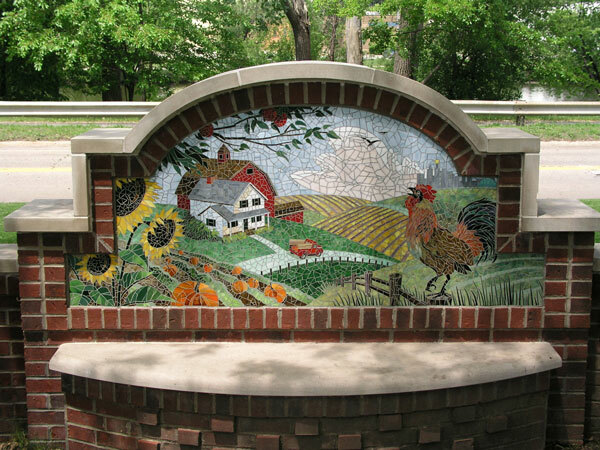 In 2004, the Ruth Mott Foundation asked myself and Marcy Yurk to design a bench to be in a highly visible location in the community. 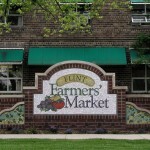 After considering several venues, the Flint Farmers Market was chosen for the location. 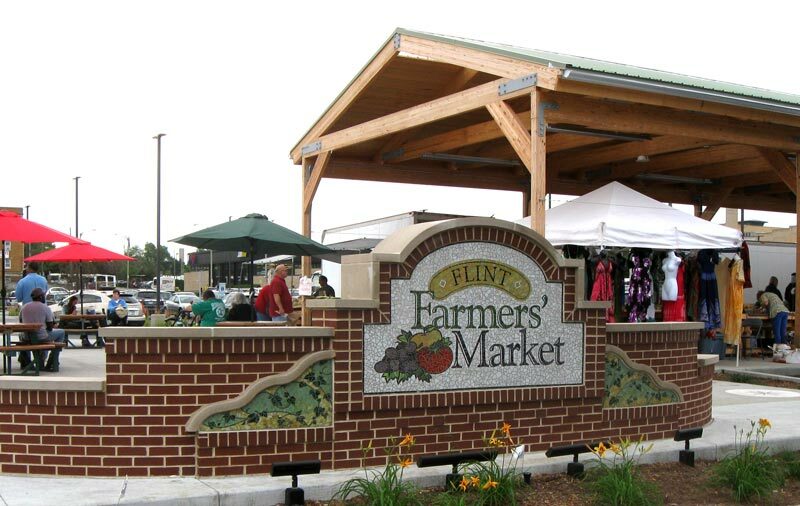 The Market embodies a unique cross section of the Flint community, and, especially in the summer, captures a festival-like atmosphere which draws crowds. 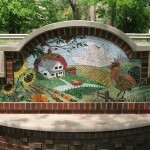 The design turned into more than a bench. 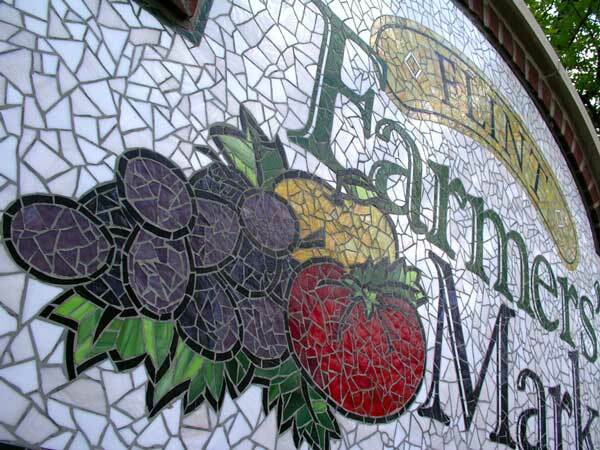 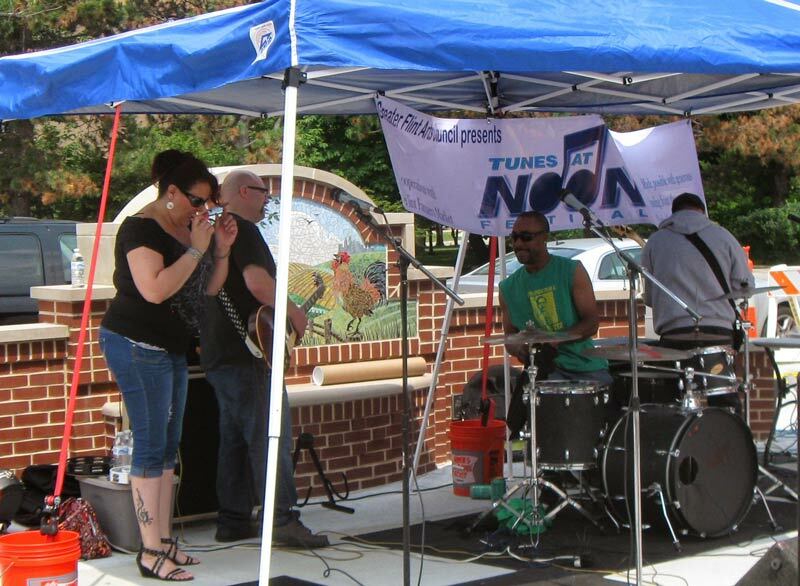 A mosaic sign incorporating the Market logo was included facing Boulevard Drive, the bench turned into a low wall which defines the music performance space on the weekends, and a mural that captures the “spirit” of the Market faces the building above a central limestone bench. 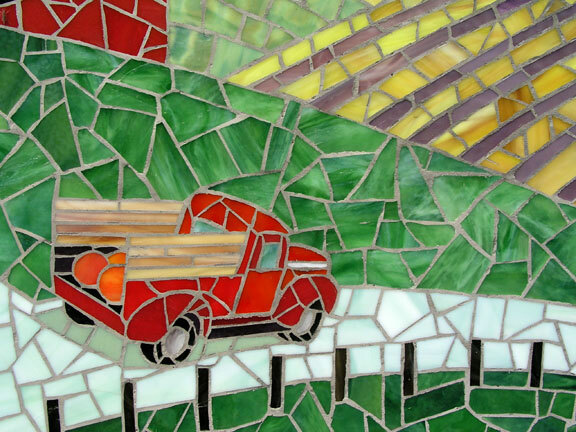 The mural depicts a pastoral farm scene with a truck on it’s way to the Flint skyline in the distance. 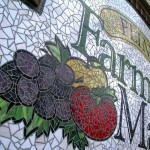 The Market “wall” has become a popular spot to sit for lunch, for kids to climb on, and for photographs in front of the mural. 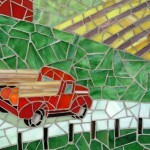 All the mosaic work in this project is fabricated from glass. 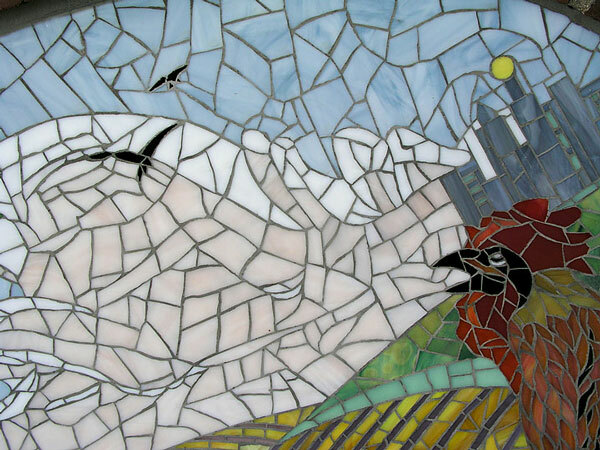 The masonry was crafted by local bricklayers Dave Smallidge and Charlie Marks. 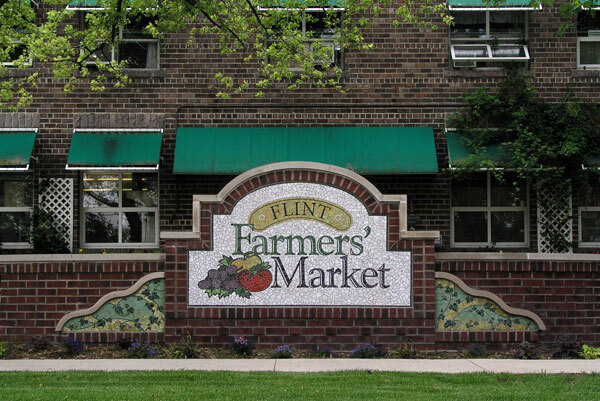 In 2014, the Flint Farmers Market was moved to Downtown Flint, at the previous Flint Journal site. 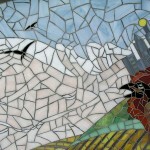 The masonry wall, with the mosaics intact, was moved with great care and difficulty, to the new site. 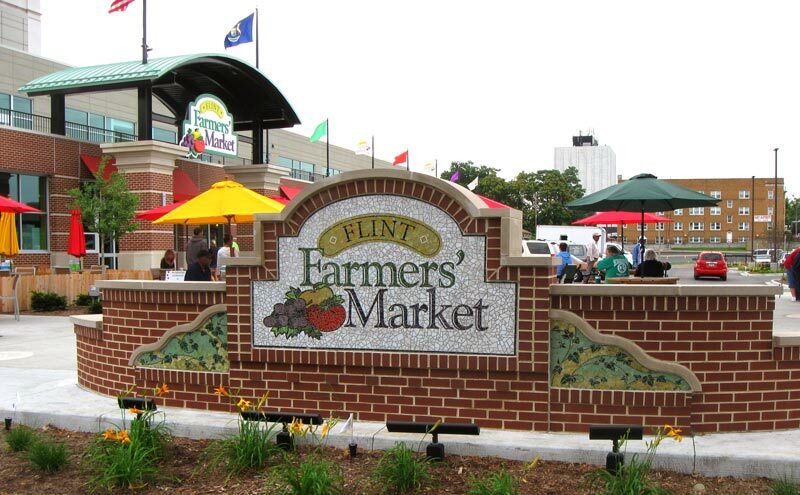 It now defines a new plaza site between the outdoor vendors and the interior marketplace.